Longer transmission life under extreme loads... Made with premium quality synthetic fluids and additives AMSOIL transmission fluid can handle extreme loads and longer life. Helps reduce sludge and varnish buildup... Keeps your transmission clean with outstanding protection against sludge and varnish deposits that clog fluid flow inside your transmission and contribute to clutch glazing. High temperature protection... AMSOIL transmission fluid helps keep your transmission cooler and lets you operate hotter longer under severe conditions as compared to conventional fluids. More responsive shifting in cold weather. AMSOIL ATF is wax free with excellent cold flow properties syou your shifting is more responsive, you get better gas mileage and warm-up time is reduced. Varying speeds and loads causes torque multiplication and extreme stress on gears and bearings. To prevent wear damage consistent with low-quality fluid and ruptured fluid film, AMSOIL formulated Synthetic Multi-Vehicle ATF with high film strength (shear stability) and premium anti-wear/extreme-pressure additives (boundary film barrier). AMSOIL Synthetic Multi-Vehicle ATF protects transmissions during severe-duty service. Today’s transmissions are smaller and must withstand higher horsepower and torque while delivering smoother shifts, all with longer fluid life recommendations. AMSOIL Synthetic Multi-Vehicle ATF is formulated with friction modifier additives that deliver outstanding clutch-holding capacity (static friction), torque-transfer ability (dynamic friction) and anti-shudder properties (slipping torque converter clutches). Hot temperatures are no excuse for poor reliability. Naturally heat resistant and heavily fortified with anti-oxidants, AMSOIL ATF exceeds the most demanding oxidation requirements. AMSOIL ATF delivers outstanding protection against sludge and varnish deposits that clog narrow oil passages and contribute to clutch glazing. 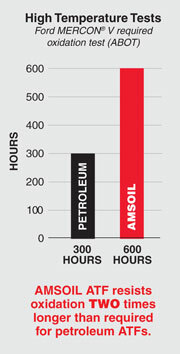 Transmissions can operate hotter and longer with AMSOIL ATF than with conventional fluids. Cold, thick automatic transmission fluid lengthens shift times and reduces energy efficiency (fuel economy). AMSOIL Synthetic Multi-Vehicle ATF is waxfree and delivers extraordinary cold-flow properties (< -60°F pour point). Shifting is more responsive, energy efficiency is improved and warm-up times are reduced. Most drivers are unaware that transmissions commonly operate under severe service and require shorter fluid drain intervals. AMSOIL Synthetic Multi-Vehicle ATF is a long-life fluid capable of extended service intervals. It provides an extra margin of protection, especially when fluid change intervals are missed, during heavy use and even during abuse. Drivers can count on AMSOIL Synthetic Multi-Vehicle ATF to provide protection beyond conventional fluids.